Consumers can learn to spot ripoffs with a few easy tricks. With the holiday shopping season officially underway, the Los Angeles Police Department and agents from U.S. 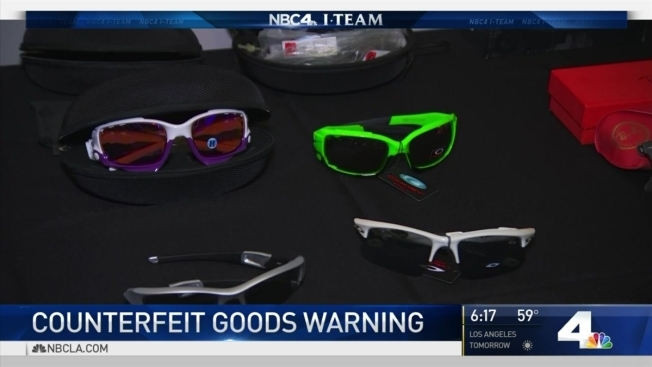 Homeland Security have teamed up to help people spot counterfeit goods. The increasing tendency for people to shop for items online has increased the possibility that they might get scammed, said Joseph Mecias, special agent in charge for Homeland Security in Los Angeles. "Sometimes you get hyperlinked to websites that say 'the real Oakley' or 'the real NFL,'" Mecias said, adding that consumers should be weary of websites that list items significantly cheaper than multiple other websites. When it comes to electronics, counterfeits could cause safety hazards such as fires, said John Drengenberg, consumer safety director for Underwriters Laboratories. •	If a deal seems too good to be true, it probably is. •	Buy from retailers you know and trust and go directly to their websites. •	Manufacturers of quality products want to be noticed; if a product does not have the manufacturer's name, it could indicate a fake. •	Look out for misspellings on the product's packaging or instruction manual. •	With electronics, an overly flexible wire could mean there is not enough copper in the wire to handle the voltage, which could cause overheating and lead to a fire. NBC4's Rudy Chinchilla contributed to this report.